As consumers around the world have become increasingly dependent on electronics, the transistor, a semiconductor component central to the operation of these devices, has become a critical subject of scientific research. Over the last several decades, scientists and engineers have been able to both shrink the average transistor size and dramatically reduce its production costs. The current generation of smartphones, for example, relies on chips that each feature over 3.3 billion transistors. Most transistors are silicon-based and silicon technology has driven the computer revolution. In some applications, however, silicon has significant limitations. These include use in high power electronic devices and in harsh environments like the engine of a car or under cosmic ray bombardment in space. Silicon devices are prone to faltering and failing in difficult environments. Addressing these challenges, Jiangwei Liu, from Japan's National Institute for Materials Sciences, and his colleagues describe new work developing diamond-based transistors this week in the journal Applied Physics Letters. "Silicon-based transistors often suffer from high switching loss during power transmission and fail when exposed to extremely high temperatures or levels of radiation," Liu said. "Given the importance of developing devices that use less power and perform under harsh conditions, there has been a lot of interest within the broader scientific community in determining a way to build transistors that utilizes manufactured diamonds, which are a very durable material." And with this very interest in mind, the team developed a new fabrication process involving diamond, bringing "hardened electronics" closer to realization. 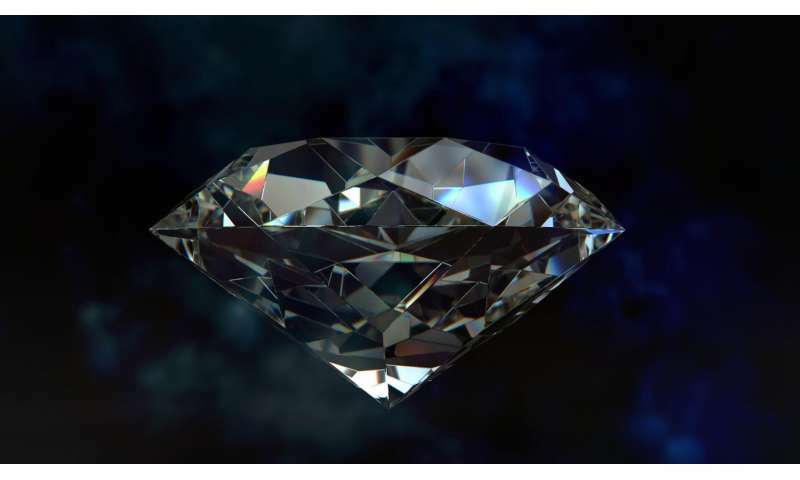 "Manufactured diamonds have a number of physical properties that make them very interesting to researchers working with transistors," said Yasuo Koide, a professor and senior scientist at the National Institute for Materials Science leading the research group. "Not only are they physically hard materials, they also conduct heat well which means that they can cope with high levels of power and operate in hotter temperatures. In addition, they can endure larger voltages than existing semiconductor materials before breaking down." The research group focused their work on enhancement-mode metal-oxide-semiconductor field-effect transistors (MOSFETs), a type of transistor that is commonly used in electronics. One of the distinguishing features of transistors is inclusion of an insulated terminal called a "gate" whose input voltage determines whether the transistor will conduct electricity or not. "One of the developments that makes our fabrication process innovative is that we deposited yttrium oxide (Y2O3) insulator directly onto the surface of the diamond [to form the gate]," said Liu. "We added the yttrium oxide to the diamond with a technique known as electron beam evaporation, which involves using a beam of electrons to transform molecules of yttrium oxide from the solid state to the gaseous state so that they can be made to cover a surface and solidify on it." According to Liu, yttrium oxide has many desirable qualities, including high thermal stability, strong affinity to oxygen and wide band gap energy, which contributes to its capabilities as an insulator. "Another innovation was that the yttrium oxide was deposited as a single layer," Liu said. "In our previous work, we have created oxide bi-layers, but a single layer is appealing because it's less difficult and less expensive to manufacture." Liu and his colleagues hope to refine their understanding of electron movement through the diamond transistor with future research projects. "We work with a type of manufactured diamond that has a hydrogen layer on its surface. One of the important challenges going forward will be to understand the mechanism of electron conduction through this carbon-hydrogen layer," said Liu. "Ultimately, our team's goal is to build integrated circuits with diamonds," Koide said. "With this in mind, we hope our work can support the development of energy-efficient devices that can function in conditions of extreme heat or radiation."